Flying foxes have been on the decline for decades, and there's no hope in sight. Found only on the island of Mauritius in the Indian Ocean, the Mauritius Fruit Bat is threatened with extinction because of habitat loss, hunting and now government culls over conflicts with fruit-farmers. Three decades after being recognized as a group in need of conservation efforts, large fruit-eating bats still face an increasingly uncertain future on tropical islands as populations dwindle and threats close in, according to a Texas Tech University faculty member's new Perspectives article in Science magazine. 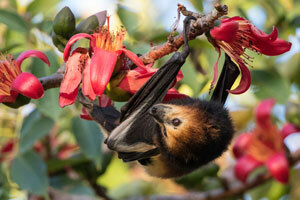 Through the article, "Can we protect island flying foxes?" Tigga Kingston, an associate professor in the Department of Biological Sciences, and her co-authors – Christian E. Vincenot from Kyoto University and F. B. Vincent Florens from University of Mauritius – hope to promote conservation action and research on the bats to halt further declines. "Island flying foxes were recognized as a group of conservation concern more than 30 years ago when intense hunting and commercial trading of species on Pacific islands precipitated the extinction of at least one species, the endemic Guam flying fox, and led to dramatic declines in others," Kingston said. "Thirty years later, flying fox populations on islands are still declining because of hunting and habitat loss, and new issues, notably conflict between bats and fruit growers over crops, have arisen." The Mauritius Fruit Bat flying free -- despite international protest, the government of Mauritius reported culling over 40,000 individuals in just two years. According to the article, this conflict has led the government of one island nation, Mauritius, to implement mass killings of one species, Pteropus niger. The government's figures suggest at least 45 percent of the overall population was eliminated during the events. Kingston and her co-authors note that losses likely top 50 percent due to illegal killings and incidental mortality of bat pups. The article resulted from a symposium on the conservation of island vertebrates during the Second International Conference of Island Evolution, Ecology and Conservation in 2016. Kingston, Vincenot and Florens all presented about flying foxes and decided the time was right for an update on the animals' situation. 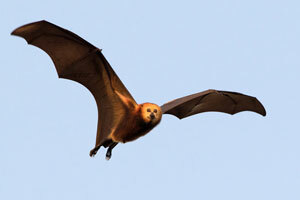 "I had hoped that 30 years on, the conservation status of flying foxes on islands would have improved," Kingston said. "That's not the case. Like all island flying foxes, the Mauritius Fruit Bat plays a key role in island ecosystems as a pollinator and seed disperser. "Conservation on islands is especially challenging – island populations are inherently small, often endemic to the island or of limited distribution, and threats such as loss of native habitats and introduction of non-native species commonly interact to place immense pressure on remnant populations," she explained. "Within this context, however, island flying foxes are particularly vulnerable because they are simultaneously subject to so many interacting threats and reproduce very slowly. So populations are very slow to recover from losses, increasing extinction risk." Of the 65 species of flying foxes, 53 species are restricted to paleotropical islands and archipelagos in the Pacific and Indian oceans. 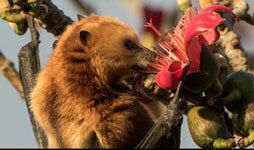 Nearly half of all flying fox species, 31, are threatened with extinction, and 28 of them are island species. 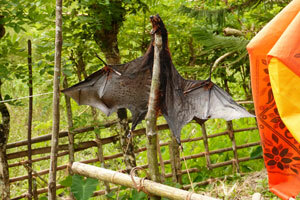 Retaliatory killing in the Andaman Islands – the skinned remains of Blyth's flying fox caught visiting fruit trees tied to a fence to be decomposed by ants. Fruit bats are classified as Vermin under the Indian Wildlife Act and there is an urgent need to rework legal status of many island flying foxes. Females typically don't give birth until they are two or three years old, and only have one young a year. Consequently, populations are slow to recover from disturbance and persecution. "On top of all this, bats often have a bit of public relations problem, feared or associated with negative myths, or just considered a nuisance, and the importance of the critical ecosystem services they provide to island communities is rarely known," Kingston said. 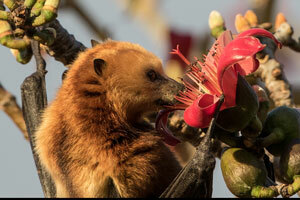 "Island flying foxes play keystone roles as seed dispersers and pollinators of both native and economically important plants, and on many islands they are the only effective disperser or pollinator left. The rest, like the dodo on Mauritius, are already lost to extinction. The key point is that declines and losses of flying foxes are not just a tragedy in their own right, but will have profound consequences for island ecosystems in the coming decades." The Department of Biological Sciences in the College of Arts and Sciences at Texas Tech University hosts a variety of academic degree programs aimed toward the advancement of knowledge, learning, teaching and research of the natural world.